After Pearl Harbor and the start of World War II, fiercely independent heroine Velva Jean enlists, gets her wings, risks her life—and her heart in this bold and inspiring novel from the author of the New York Times bestsellers Holding Up the Universe and All the Bright Places (soon to be a major motion picture starring Elle Fanning). Bristling at the limitations faced by a woman in rural Appalachia and fueled by the memory of her late Mama telling her to “live out there,” Velva Jean hits the road to pursue her dream of singing at the Grand Ole Opry. Little does she know that another captivating adventure awaits: one that will send her literally soaring. But then, her beloved big brother pays a surprise visit and treats Velva Jean to a flying lesson that ignites a brand-new dream: to become a female pilot with the WASPs of World War II. 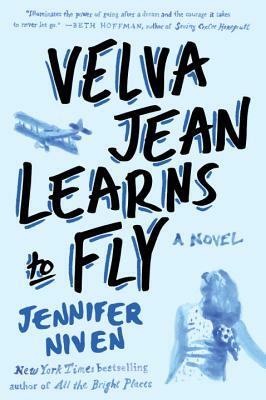 Funny, poignant, and utterly unforgettable, Velva Jean Learns to Fly will have fans cheering all over again. Jennifer Niven is the New York Times bestselling author of All the Bright Places and Holding Up the Universe, as well as the popular Velva Jean series. She is also the author of several non-fiction books, including Ada Blackjack, The Aqua-Net Diaries, and The Ice Master, which was named a top non-fiction book by Entertainment Weekly. Her New York Times bestseller All the Bright Places is soon to be a major motion picture starring Elle Fanning. Although she grew up in Indiana, she now lives with her fiancé and literary cats in Los Angeles, which remains her favorite place to wander.